“The Best Game I Ever Missed”. See below for Parts 1 and 2. 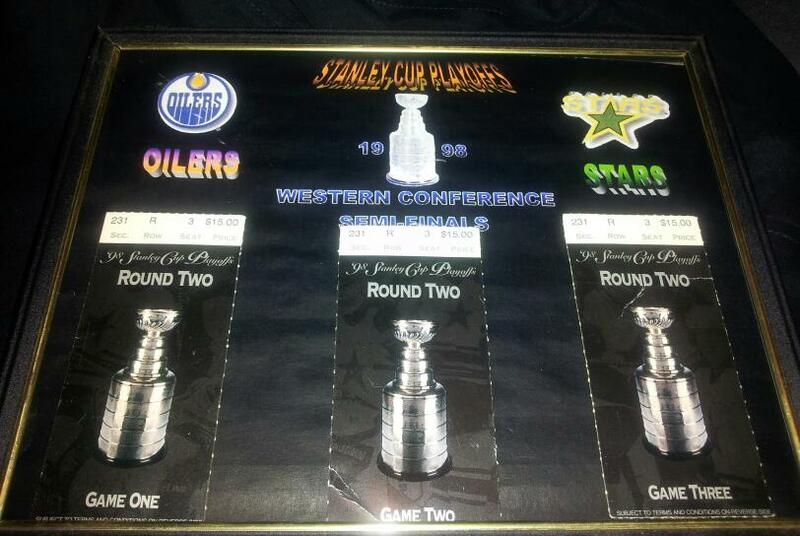 The Western Conference Finals were here and as excited as I was there was little I care to remember about this series. It was here that the loss of Joe Nieuwendyk was noticed the most. The Stars could not match up with the Red Wings high-powered offense. They split the first two in Dallas which ended my face painting streak. The Stars then lost the next two in Detroit and the future looked bleak. We would need to be as loud and as supportive as we could when the game came back to Dallas for game 5. That is when I got the news I didn’t want to hear and it would leave me with a tough decision to make. At the time I worked for very small electronics company that installed computer monitoring systems for computer rooms. I had spent most of my time there in house, building the equipment and designing the computer graphics. Our field technicians had gotten in over their heads and our contract with a major telecommunications company and perhaps the business itself were in jeopardy if I did not fly to Crystal Lake, New Jersey and get things under control. It was tough but I gave my sister my ticket to game five. I had hopes that I could get things under control and be back by Wednesday night, but deep in my heart I knew this would not be the case. My true hope was that they could extend the series so that I would be back for at least one more game. On the road we had to work 7pm – 9am so that we would not interfere with our customer’s normal business. Monday and Tuesday I worked harder than I had ever done before. I got more accomplished in those two nights than the other two field technicians did in a month. When I think about it that hard work probably backfired on me as I was made to do more traveling later and miss more games. Wednesday came and I had to go back to work before the game even started. As productive as I had been the first two days I had become just the opposite that night. It had become obvious to the plant manager who had been impressed with my work the two days previous. He decided to take us out for a dinner break and asked me where I’d like to go. I said, “I don’t care where we go as long as they are showing the Stars game.” That was difficult because everyone was showing the Bulls and Jazz play in the NBA finals. Three bars later we find just the place. It was the good news I had hoped for. I screamed and did a victory dance and lap around the building. I know it was very professional of me. Guy Carbonneau scored in the closing moments of the third period to send it to overtime. Then Jamie Langenbrunner caught Chris Osgood by surprise with a shot from the blue line to win the game and send us to game six. We lost game six and the Red Wings went on to win the Cup. 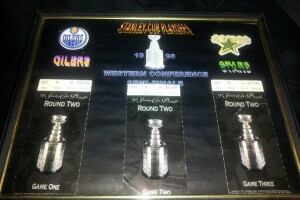 I was happy in the sense that the series was extend, but now I’d have to face the fact that I gave up tickets to the greatest game in Dallas Stars history. Well at least to that point. It was the greatest game I ever missed. Yes, it was only a game, but it wasn’t till later that I realized it represented much more. 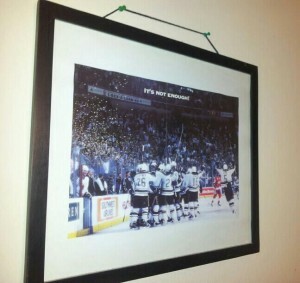 In the offseason we received our season ticket holder renewal package that had a picture of the Stars celebration after that Red Wings game with the title, “It’s not enough.” I framed the photo and hung it on the wall in my workout room. Its message is a great motivational tool to keep me working hard and not to settle for anything less than my goals. However, the background of my experience gives it an extra meaning. I became a workaholic and did everything for my job. This photo is also a reminder to never let my hard work and goals interfere with the present and my ability to enjoy the journey. In honor of our friendly cross division mini series against Anaheim, here is a gem which I am sure you age-old Stars fans will remember. Go ahead and refer to the videos before or after you read this, they offer a great two-sided perspective and background commentary to the situation without ruining the award-winning banter of the great Ralph and Razor. In retrospect, this game was very poorly timed for the Stars. When I was 8 years old, I didn’t know that. Having been a Stars fan for less than 3 years at the time, it was something I hadn’t seen, but on Friday, March 13, 1998, my eyes were open to a side of hockey I was oblivious to. At the time, we had partial season tickets, but I was not at this particular game. I did the routine “rush-through-dinner” number before I sunk into my spot on the couch next to my likewise very enthusiastic and outspoken hockey-mom. Craig Ludwig (one of my favorite players of all time) threw a pretty treacherous and highly illegal elbow to Selanne’s head. One thing to note is Anaheim’s other star player, Paul Kariya, had been injured without consequence from his own team very recently. The Ducks had received significant media criticism for the lack reaction to one of their best player’s injury. Luckily, with backup Roman Turek (Eddie wanted to be in there, I am sure) in net and several key players out of the lineup, there was minimal potential effect on the lineup long-term. My favorite part, every time I re-watch this debacle (approx once every two months), is Ludwig’s eventful trip off the ice and LeBoutillier’s subsequent dramatic exit which included the robust discard of his stick onto the ice out of disgust. Furthermore, Brent Severyn was a key culprit in beating the snot out of our beloved Daryl Sydor, twice. Sevvy is now a valued member of the hockey community in Dallas after having spent some time playing for the Stars later in his career. In the videos, he provides a good two-sided “explanation” and “play-by-play” of this brawl. The game spins out of control, benches clear, and every faceoff turns into a scrum for several shifts. The crowd seems to love it, the arena DJ was playing fueling music, and the coaches were ensuring the right players were on the ice to keep up the fighting. All the while, Ralph and Razor did not seem amused (don’t they sound so young?). Photo Credit: www.wn.com World News Inc.